Last time San Diego hosted BIO in 2014, San Diego companies were inundated with requests for meetings from visitors looking to make connections outside of the convention center. After all, if you are going to visit one of the world's preeminent biotech hubs, you better take advantage of your surroundings. Many of these meetings result in inbound investment opportunities for San Diego businesses and research institutions. The 2017 BIO International Convention, the world’s leading biotechnology conference, comes to San Diego June 19 - June 21. In 2017, BIO is projected to attract more than 16,500 attendees, with more than 2,000 individuals coming from international destinations. These delegations, comprised of venture capitalists, foreign dignitaries, private companies and others, collectively send hundreds of requests to businesses and organizations for tours and meetings outside of the San Diego Convention Center. San Diego’s life sciences cluster received more than $1.7 billion in FDI – more than 75 percent of the region’s total FDI during that quarter. Discoversdbio.com will function as a one-stop-shop for delegations seeking opportunities in the broader San Diego community during BIO 2017. The tool will streamline requests, improve the tracking of visitors and strengthen the follow through. Delegations are directed to a website that captures contact information, delegation make-up, requested company tours and more. San Diego life sciences companies and/or research institutions that are interested in hosting delegations, please contact Drew Garrison at dg@sandiegobusiness.org to be added to the website. San Diego Regional EDC, the parent organization of WTC San Diego, will also be running subsequent programming during BIO 2017 as a way to market the region and attract additional inbound investment. EDC will launch an economic impact study on San Diego’s genomics industry, making San Diego the first region in the U.S. to quantify its genomics industry. Today, the Brookings Institution released its first-ever metro-level analysis of foreign direct investment’s role in the San Diego metropolitan area’s economy as part of its Global Cities Initiative, a joint project of the Brookings Institution and JPMorgan Chase. The report analyzes the types of foreign-owned businesses located in the San Diego metropolitan area, outlines the region’s sources of foreign investment and shows that 48,370 jobs are supported by FDI locally. 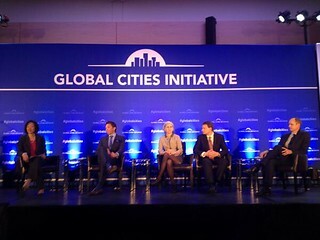 Since April 2014, San Diego has been part of a Global Cities Initiative pilot program to create and implement metropolitan plans to secure and sustain FDI. The FDI in U.S. Metro Areas report will help the region’s Global Cities Initiative team – comprised of leadership from the City of San Diego, San Diego Regional EDC, BIOCOM and Qualcomm – design its plan to maximize the amount, quality and economic benefits of FDI in the region and integrate FDI into an overall smart economic global trade and investment strategy. San Diego is one of two cities - and the only in California - that Brookings selected to publish and develop its FDI plan. While the United States remains the world’s top destination for foreign investment, its position has been steadily eroding. Between 1999 and 2012, the U.S. share of global FDI inflows dropped from a high of 26 percent to just 12 percent. However, metropolitan areas are the country’s strongest magnets for global investment and so understanding the San Diego metro area’s FDI starting point will help the region fully leverage FDI to advance its economic development. According to the Brookings report, the benefits of FDI extend well beyond the millions of jobs supported. For example, U.S. affiliates of foreign companies pay well above average wages. These companies strengthen U.S. trade, producing more than one-fifth of all U.S. goods exports. Additionally, nineteen percent of all corporate R&D expenditures in the United States come from foreign-owned companies. Finally, 48 percent of total FDI flows in 2012 went to manufacturing industries, shoring up the nation’s eroding production base. While metro areas have traditionally focused on attracting greenfield investment, this new data shows that most FDI enters regions through mergers and acquisitions. In the average year, mergers and acquisitions account for 87 percent of all FDI inflows into the United States. These investments have significant economic potential—for example, cash infusions can help local businesses expand, and new access to global distribution networks can boost exports. 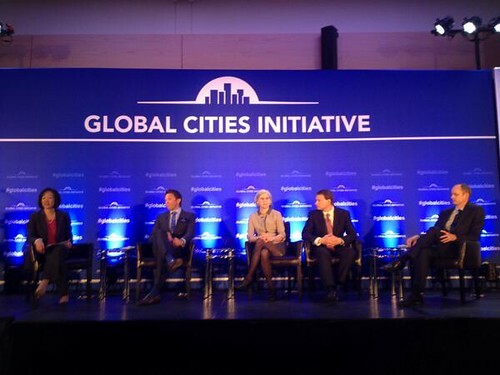 Next week, leaders from San Diego will travel to Louisville, Ky. to take part in a Global Cities Initiative panel. San Diego is one of only six cities selected to participate in a new pilot program to attract foreign direct investment (FDI) to the region as part of the Global Cities Initiative, a joint project of the renowned Brookings Institution and JPMorgan Chase. San Diego joined Columbus, Minneapolis, Portland, San Antonio and Seattle in Seattle today to participate in the first working session, where leadership will collaborate with other regions to address the region’s foreign direct investment plan. San Diego’s team is made up of representatives from the City of San Diego, UC San Diego, JPMorgan Chase, Biocom, Qualcomm, GO-Biz and San Diego Regional EDC. Foreign direct investment has long supported regional economies, not only by infusing capital, but also by investing in workers, strengthening global connections and sharing best business practices. As the world’s largest economy with a stable investment environment, the United States has been a top destination for foreign direct investment and San Diego is looking to ensure it pulls in a significant portion of this FDI. In San Diego, many small and medium-sized enterprises have pushed their attention towards the issue of capital. As venture capitalists around the U.S. become more selective about companies they invest in, we must look for alternative solutions. FDI is one answer. Although FDI sounds like an elusive term, this means more capital flow to the region as well as more international attention paid to San Diego which has a strong economic payoff. San Diego has many strengths, and one of our admitted struggles is that it’s difficult to form a distinct global identity when we have so many industries of which to be proud. We are home to a thriving biotech sector where companies like Illumina - dubbed the “World’s Smartest Company” - are based. We have a strong defense sector that is second to none. From our telecom industry to our sports innovation and algae biofuels cluster, the region is an innovation hub. One thing that Sean stressed during the panel is that although San Diego loves its sun, we need to be comfortable shedding our strict tourism message and moving beyond “sun and Shamu.” Working with the Brookings Institute to increase San Diego’s share of FDI is one way to do this. As part of the pilot, San Diego will develop a foreign direct investment market assessment and plan, along with an implementation plan and a policy memo. This work, added to the region’s existing export plan, forms the second core component of a global engagement strategy that will strengthen the region's global economic connections and competitiveness. San Diego is the only city in California selected for this pilot program and is one of only two cities in the program for which Brookings will be developing and publishing the complete FDI plan. EDC recently joined a delegation of nine California organizations, organized by the California Governor’s Office of Business and Economic Development (GO-Biz), at the inaugural SelectUSA Investment Summit in Washington D.C. 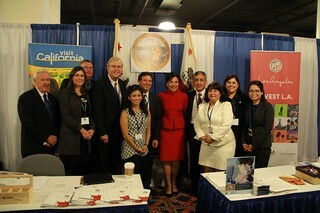 The goal was to promote the golden state as the prime spot for international trade and investment. Hosted by the Department of Commerce, the summit connected top-level corporate executives and investors from the U.S., and around the globe, with the nation’s economic development organizations at the state, regional, and local levels. Despite the federal government shutdown a few weeks prior, it was business as usual in the nation’s capital. “The United States is open for business,” President Obama told a sold-out room at the conference. The two-day conference welcomed more than 1,000 attendees from nearly 60 international markets and 47 U.S. states, three U.S. territories, and the District of Columbia. Featured speakers, in addition to the President, included Secretary of Commerce Penny Pritzker, Secretary of State John Kerry, Bill Simon (President and CEO of Walmart U.S.), Parker Harris (Co-Founder of Salesforce.com), and Ludwig Willisch (CEO of BMW North America). The summit also featured more than 70 high-level speakers covering topics such as workforce development, public-private partnerships through infrastructure investments and exports. Why is foreign direct investment (FDI) important? Direct investment in the United States – from foreign or domestic firms – is a critical factor in economic growth and job creation. In 2012 alone, the U.S. attracted more than $160 billion in foreign direct investment (FDI), making us the world’s top destination for FDI. In 2011, foreign-owned companies in the U.S. were responsible for employing 5.6 million U.S. workers. Where does California stack up in comparison to other U.S. states? In April of this year, California Governor Jerry Brown announced more than $1.8 billion in deals making the state number one for attracting FDI. Foreign-owned companies account for more than 700,000 jobs in the state. At the conference, President Obama announced the first-ever comprehensive effort led by the federal government to attract job-creating foreign investment to the U.S. through the expansion and enhancement of the SelectUSA initiative. The initiative seeks to grow FDI as the nation emerges from the recession and becomes an increasingly competitive location for attracting investment due to rising productivity, abundant low-cost energy and rising costs elsewhere. With the announcement, regions like San Diego can expect a smart FDI strategy that integrates export promotions, workforce development, innovation cluster creation and land use planning. Such a strategy will reap the many benefits of international trade and investment—including new better paying jobs, new tax revenues, knowledge spillover and global connectivity. What does this mean for San Diego? San Diego’s active role in the State of California’s collaborative and coordinated investment promotion efforts is needed to engage and attract future investors; our partnership with the Brookings Institution on the Metropolitan Export Initiative will create a regional export strategy that will boost the local economy and create jobs; and our ongoing involvement with the Global Cities Initiative to spur and strengthen regional global engagement puts San Diego on track for creating a blueprint for global competitiveness.